The feel good singer/songwriter is here for the summer! 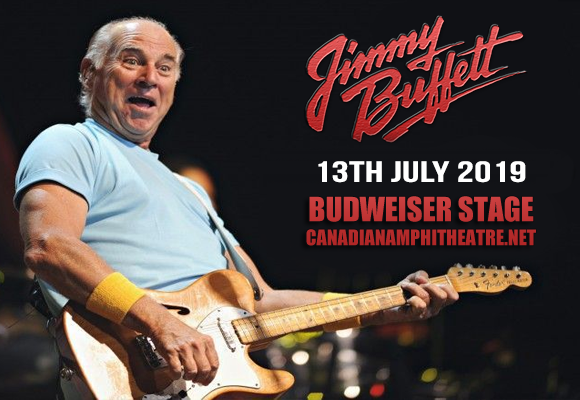 Jimmy Buffett comes to Budweiser Stage on Saturday 13th July 2019 for another groundbreaking performance as he brings his sunshine fulled show to the stage on a special performance. Jimmy Buffett is a regular favorite on the scene so make sure that you don't miss this incredible event! Tickets are on sale NOW!! "Jimmy Buffett’s music and aura have the ability to transport his fans to a vacation state of mind. Listening to Buffett’s music is the audio equivalent of kicking off your sandals, lying on the beach, soaking up sunshine, and enjoying a cold beer. Song after song places the listener further into a carefree condition that they don’t want to end." The glorious performer Jimmy Buffett is an absolute star on the touring circuit as he entertains "Parrotheads" effortlessly where-ever he goes. His music brightens up any stage he stops off to create a paradise feel for his fans and gives crowds the night of their lives. His songs are full of hilarious anecdotes, and his performances gives an interactive space for people to truly get involved, this is the place to totally chill as you take in all the vibes when catching his shows live in concert. Known best for his singles “Why Don't We Get Drunk (And Screw)” and “Margaritaville” (ranked 234th on the Recording Industry Association of America's list of "Songs of the Century"), Buffett is a singer, songwriter, author, actor and businessman whose move across the country from Nashville to Key West brought about the laid-back “beach bum” persona that we all know and love. Come and catch Jimmy Buffett LIVE this coming summer season – it's the perfect show for that perfect summers day, it's never too early to plan for! As we look forward to those blue sky days, book your tickets online today and ensure that you will be a part of the event!